Imphal, Nov 20 : Imphal Valley is in the grip of panic as the indefinite blockade of highways launched by Kukis entered its third day on Monday. People in the restive valley began stocking up on fuel and essential commodities as about a 100 trucks carrying essentials have been stranded on the Imphal-Dimapur and Imphal-Silchar highways that connect the Meitei-dominated valley with the country. Police said about 50 trucks loaded with essential are stranded at Senapati and they would be escorted to Imphal soon. As the strike continues, stock of food and other essential commodities in Imphal dwindled even as the state government has invited the Kuki State Demand Committee (KSDC) leaders for talks on Tuesday afternoon. KSDC is demanding a separate Kuki homeland. In 2010, Imphal Valley suffered unprecedented hardships because of a 121-day blockade called by Kukis and Nagas. Prices of cooking gas at that time had risen to Rs 2,000 while petrol was sold at Rs 250 a litre in the grey market. 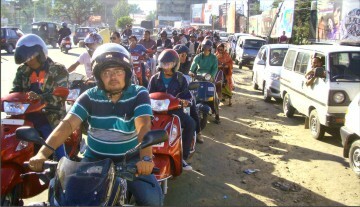 On Monday, long queues of vehicles were seen at the petrol pumps in Imphal. Till the time of filing this report, the rate of petrol soared to Rs 90 in the grey market. However, the prices of pulses, vegetable and baby food remained unchanged. The strike is set to continue until the Centre gives an official assurance that political dialogue between with KSDC and Kuki militant groups - currently under suspension - ill be resumed on a prearranged date to deliberate on the Kukis' demand. KSDC's proposed map of a 'Kuki state' covers Churachandpur and Chandel districts, Sadar Hills in Senapati district and large chunks of land in Tamenglong and Ukhrul districts. Ukhrul, Tamenglong, Senapati and Chandel are Naga-dominated districts. The total 'Kuki area' is more than half of Manipur's territory even as the United Naga Council (UNC) has intensified its campaign for an alternative administrative arrangement for the Nagas in Manipur outside the state pending the settlement of Naga insurgency problem. Manipur deputy CM Gaikhangam, who met Union home minister Sushil Kumar Shinde on Saturday night to discuss the Kuki issues, has stated the government is inviting the striking KSDC leaders for talks on Tuesday afternoon. Besides pointing out the demands made by KSDC, Gaikhangam also urged the Union home minister for initiating political dialogue with the Kuki militant groups. Speaking to reporters on the sidelines of the observation of Indira Gandhi's 95 birth anniversary at Congress Bhavan here on Monday, Gaikhangam, as assured by the Union home minister, said the Centre would begin political dialogue with the leaders of Kuki militant groups after the winter session of the Parliament. Gaikhangam, who also holds the state home portfolio, said that the Centre would also send senior officials to Manipur to chalk out modalities of the talks. When contacted, KSDC general secretary Benjamin Mate told TOI that the committee has received the invitation for the talks from the state government. "We have decided to join the talks with the state government. A five-member delegation of the committee including me is ready to join for the dialogue on Tuesday. We hope a positive result will come out in it," Benjamin said.